Jamie Gray just jumped into the deep end of the competition pool. The Women’s Three-Position Rifle Olympic Champion, who has been recovering since the 2012 Olympics from a back injury, made her return to competition today at the ISSF World Cup Finals in Munich, Germany. Facing ten of the best competitors in the world in her first competition since the Olympics, Gray was able to secure a position in the finals and finish in sixth place. Gray (Lebanon, Pa., pictured right) qualified for the final in the eighth position with 578 points. Once in the finals where all competitors start from zero, Gray was tied for first after the kneeling stage and moved to third place in the prone stage. Once in the Standing stage, Gray fell to sixth place and was eliminated on her first elimination-stage shot. 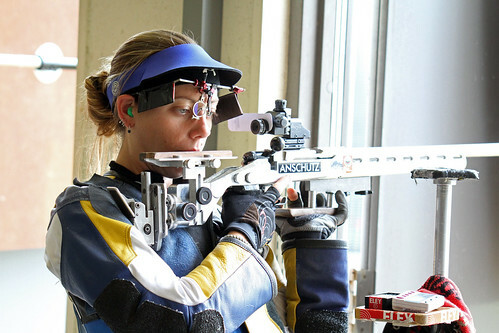 Gray won gold at the 2010 World Cup Finals in Munich and bronze at the 2009 World Cup Finals in Wuxi, China in Women’s Three-Position Rifle. Will Brown (Twin Falls, Idaho) also competed today in the Men’s 10m Air Pistol event. Brown secured his spot in today’s final by shooting a 576 in qualification, putting him in the sixth position. In the final, Brown was eliminated in the fourth series of the elimination stage. Brown secured his berth in this World Cup Finals with points earned from his gold-medal win in at World Cup USA in Fort Benning, Ga. Kicking off these World Cup Finals on Friday, Emil Milev (Temple Terrace, Fla.) won gold in the Men’s Rapid Fire Pistol event. The win marks Milev’s first World Cup Finals title. Last to compete for the U.S. team at this World Cup Finals is 2012 Olympian Michael McPhail (Darlington, Wis./USAMU) who will shoot in the Men’s Prone Rifle event on Monday. McPhail, a bronze medalist in Three-Position Rifle at this year’s National Championships, earned his berth with qualification points earned from a silver medal win at the World Cup in Changwon, Korea and a seventh-place finish at World Cup USA.